What is manure tea? It is the “tea” made by steeping aged or composted manure in water. Fertile soil is important to a good garden. However, if you have poor soil, it can offer a quick source of nutrients to help get you by until you have a chance to improve your soil. I always supplement my tea applications with ever so important trace minerals to more fully meet the needs of plants and soil. Manure is rich in nutrients, especially nitrogen. For those times when plants need more nitrogen, like the early stages of plant growth, this tea can be a real life saver. Nitrogen is good for helping plants to grow vegetation, but not for fruit setting. Once plants are ready to set fruit, you will want to back off on the nitrogen, or you may have a lot of leaves, but little fruit. 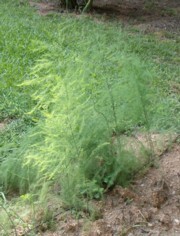 Some plants, like asparagus, are heavy feeders, and respond well to tea made from manure. I add in some sea minerals to broaden the scope of nutrients in my tea. Our primary goal of brewing compost tea is to produce trillions of microorganisms, as these are so helpful to both soil and plants. A secondary goal is providing nutrients. To dissolve the nutrients from manure into water to feed plants and soil. It’s not about microorganisms, it’s about nutrients. 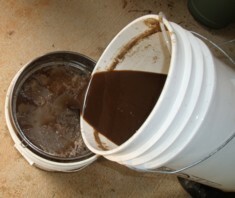 Because compost tea is all about increasing aerobic bacteria, you add molasses to feed the bacteria and brew it by bubbling air through it, at a temperature best for bacterial growth. For tea brewed from manure, no microbe food source or air bubbles are necessary. Just break up the clods, let it sit and steep, and occasionally stir, or “box” it by pouring it back and forth between 2 buckets. 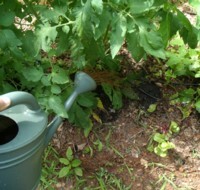 Warmer water helps to pull these nutrients out of the manure, so brew it in the sun. Which Manures are the Best? 1. Cow manure - at the top of the list! Chicken litter tends to be “hot”, meaning that it is high in nitrogen. 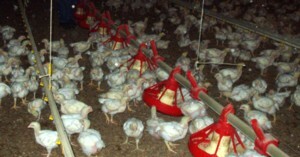 The nitrogen in chicken litter is highly available, making it a fast acting nitrogen. This means that more care must be taken in using it. It also means that you want to make sure it is well aged or composted before using it, or you can easily burn plants. This tea is special, since it is actually possible to use it without composting it first. However, it is better to compost it before using..
Because of the high nitrogen content, care must be taken in applying tea made from manure. It can burn the leaves if not thinned down enough. It can also increase your nitrogen level in the soil to a point where it is counter productive. If your manure has not been composted or “baked” in the sun long enough, there may be a danger of E Coli. It is best not to spray it on leaf crops like lettuce, cabbage, etc.